Note: All Art Impressions stamps are 15% off this week – #justsayin! Several folks asked what I would do with this little girl stamp….well let’s see, shall we? 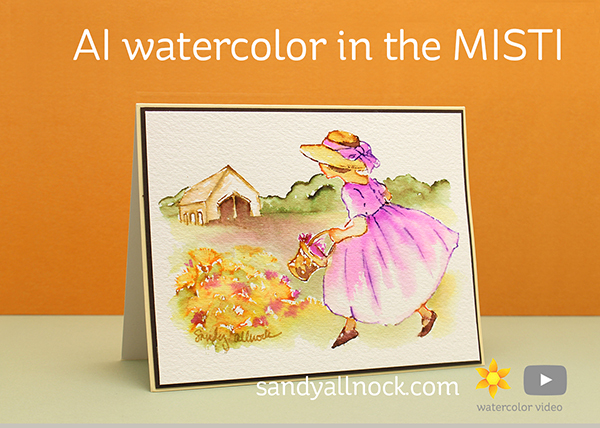 For a lot of AI watercolor, a MISTI is overkill – when you’re just adding lots of little flowers, you want to move the stamps around. But with a large image, like in the “sets” you can get, sometimes using the MISTI makes it all a bit easier. At the end of the watercoloring process, stamping a few select outlines again really helps sharpen everything up! Watch the video below or click HERE to see it in HD on YouTube. Isn’t she sweet? I used her for a couple Easter cards this year, too – just painted eggs in her basket and hid some under the bushes! I tried broadcating YT Live last week, and that didn’t go so well….my phone and YT weren’t on speaking terms. I’m going to try it again this weekend, so if you have questions about the new site or anything, that’ll be a perfect time to ask. Just go to my YouTube page and refresh a time or three. (Or four. It took ten minutes worth of tries before I gave up last week!) If it doesn’t work on YouTube, open another tab and hop over to Facebook, and I’ll chat on the artclassesdotcom page. 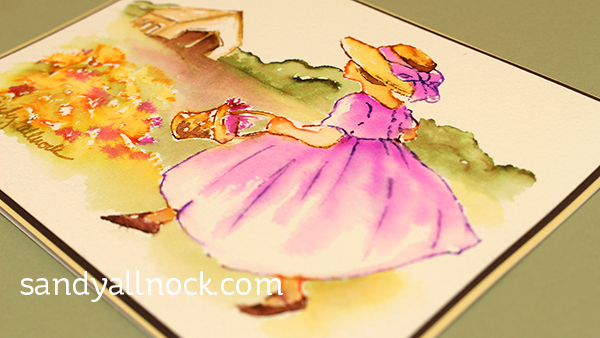 Such a pretty card… wasn’t thinking I would like doing this style until I watched you do it… looks like fun. Thanks! Such an elegant fresh looking card. This is really beautiful! Sandy your talent goes beyond words! TFS!